Connecting with NPs in your state and region can provide you the opportunity to collaborate with others who share your experiences and to work with others who share your passion for removing practice barriers. That’s why AANP was organized into 11 regions, with elected directors who serve on the board and represent NPs from their region. AANP members also elect state representatives for each of the 50 states, Washington, D.C., U.S. territories and the U.S. Virgin Islands. 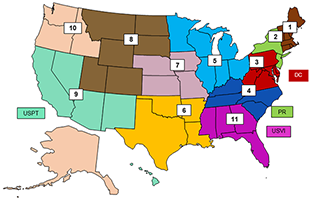 AANP is organized into 11 regions, each comprised of states within that geographic area. Each region is represented by a director, and each state includes one or more representatives elected by AANP members. Learn more about your region, including information about your Regional Director, State Representative and NP Organization members. The prestigious AANP State Award for Excellence is granted each year to deserving NPs and NP advocates. The NP State Award for Excellence is given to an individual NP in each state who has demonstrated excellence in clinical practice. The Advocate State Award for Excellence is given to an individual in each state who has made a significant contribution toward increasing awareness and recognition of NPs. Examples of past recipients have been physicians, legislators and educators. NPs are also eligible for the advocate award for non-clinical practice initiatives related to leadership, precepting, policy, politics, research, education or community affairs.